Get tickets to RailFest HERE! 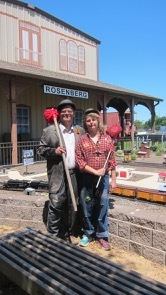 The Rosenberg Main Street Program has partnered up with the Railroad Museum to take RailFest beyond the museum Gates….. The Rosenberg Main Street Program is hosting a Hobo Walk: A Discovery Walk through Downtown Historic Rosenberg as part of this years RailFest. There are 18 “hobo stops” on the walk at various business throughout downtown including a mock Hobo Camp at the Art Park on 3rd Street where there will be hobo characters along with information on the hobo code which is much like current day emojis! Visitors can collect stickers from at least 10 of the hobo stops and return the completed ticket to the admissions tent to be entered in a drawing for a basket of goodies from downtown merchants. Visitors can pick up a Hobo Walk Ticket at the Admissions Tent outside the museum. Admission to RailFest is not required to participate in the Hobo Walk. Limit one ticket per family.